Noah Gragson was over an entire mile an hour faster, but five thousandths of a second short of the qualifying record, as he claims the pole. 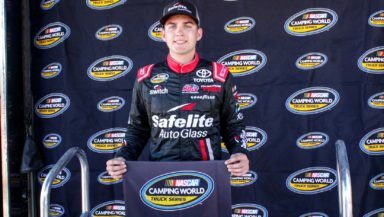 With a dominating time of 30.331 seconds at 178.036 mph, Noah Gragson will start in the top spot for this evening’s World of Westgate 200 at Las Vegas Motor Speedway in the NASCAR Camping World Truck Series. He was only 0.005 seconds shy of the qualifying record. Stewart Friesen will start to his outside in the second position. Grant Enfinger, Chris Eggleston and Riley Herbst rounds out the top five. The other drivers to make the final round of qualifying include Johnny Sauter, Brandon Jones, John Hunter Nemechek, Brett Moffit, Todd Gilliland, Tanner Thorson and Justin Haley. All drivers will start in that respective order. Gragson was fastest in the first round of qualifying at his hometrack, with Stewart Friesen and Kyle Busch Motorsports teammate Brandon Jones rounding out the top three starting positions. Gragson was fifth fastest in final practice, but only 16th during first practice; however, he set the fastest 10 consecutive lap average over Matt Crafton. All four KBM trucks made the final round of qualifying. Two playoff contenders did not make the second round of qualifying. Ben Rhodes was only able to place himself in the 18th starting position in his No. 41 The Carolina Nut Co. Ford. The other was Matt Crafton, who starts 30th with an unusual qualifying run, and puts him in an uphill battle being one of the playoff contenders. Earlier in the day, the No. 88 Ideal Door / Menards Ford was fourth and third fastest in both practices respectively. Some trucks were required to qualify on speed, but the unfortunate three that did not make the field included Tate Fogleman, JJ Yeley and Norm Benning. Tune into the only September Truck race of 2018 by listening live on radio with MRN (Motor Racing Network) or watch on television with FS1 later this evening at 9:00pm ET.